This fish finder comes with a 5-inch Color VGA display, Dual Beam technology, and a screen resolution of 480 x 640-pixels. The benefits of this fish finder are vast. It has a few notable features such as split screen, split screen zoom, sonar history, and HD-ID tracking technology. However, it doesn’t come with a GPS. One of the greatest strengths of this unit is the precision of its sonar. Garmin Echo 551dv comes with many additional features and commodities. This fish finder has a powerful sonar and a high-quality display. It offers exceptional images and visual presentations of the situation below the deck. Whether you’re an experienced angler or an amateur, this device will come in handy. In this review, we are going to pay attention to certain technical details as well as overall quality of the product. If you’re in a dilemma about which fish finder suits you the most, read this article, and you may find it helpful. That said, it also comes with a powerful DownVu transducer which produces quite accurate readings. 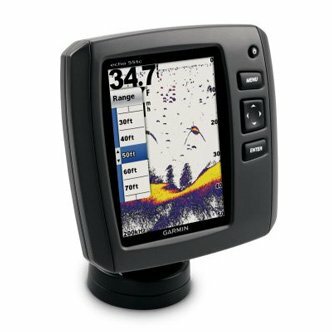 Garmin fish finders are well-made and quite functional. The 5 inches of screen surface is enough for you to distinguish particular shapes and forms underwater. Although there are fish finders with a bigger screen available on the market, this size is satisfactory. The good thing about this fish finder is that it has a color VGA screen which helps you read the data from it with ease. Although black and white screens seem outdated, there are still some products available with gray color screens; that’s why having a color screen is an advantage. The resolution is also quite good. You won’t have any issues recognizing particular shapes on display. Whether you’re looking for fish or you’re just scanning the bottom, the resolution of this screen is good enough to offer you an incredible visual presentation. This particular transducer has capabilities of both DownVu and regular dual-beam sonar. The high amount of power output from of the transducer allows the sonar to penetrate great depths. This instrument has a depth capability of 2300 feet which is perfect for people who prefer fishing in deep water. This sonar is also useful for separating the structures in the bottom from your targets. The DownVu scanning provides high-quality images of the terrain underneath the vessel. This transducer also supports Dual-Beam sonar with 50 kHz and 200 kHz dual frequencies. It also includes an all-in-one advanced HD-ID transducer. First of all, having a split screen commodity is highly valued. With split screen multitasking becomes easy. You can split the screen and, for instance, scan the same area with different frequencies to get an accurate reading. Also, split screen zoom feature allows the user to compare the same image with different zoom levels. It comes in handy if you’re having trouble identifying the structures below. Sonar History offers you to review your readings retrospectively. By rewinding your sonar history you might catch some details you’ve missed the first time. It’s a great feature to have in your fish finder. One other thing that’s an upside of this fish finder is the water temperature sensor. By having an insight on the water temperature, you can pinpoint what’s lurking under the surface exactly. Also, you can collect valuable data about fish migration and preferred temperatures. Echo 551dv has an audible alarm as well as Fish Symbol ID. Ultrascroll feature is for targeting fish arches at high speeds. Bottom lock feature shows returns from the bottom up and keeps the bottom displayed. Smooth Scaling is also a useful thing to have. Smooth Scaling offers a seamless transition from shallow to deep water and vice-versa. One of the biggest upsides of this fish finder is the powerful sonar. The advanced HD-ID and DownVu transducer are also very valuable features. This sonar provides some of the best readings on the market while still maintaining its affordability. As we said, the split screen mode is also an upside for this particular device. It also has a lot of extra features that will come in handy and make it easier for you to target fish. That said, this fish finder doesn’t have any significant drawbacks. The only one that might be severe is the lack of GPS. With GPS it’s easier for you to mark waypoints, track your movement, and fish safely. In fact, if you’re planning to fish in unfamiliar waters, consider buying an additional GPS device to synchronize with this fish finder. Although GPS isn’t a necessity, it’s a major factor in modern fishing. Chartplotting is also unavailable due to the lack of Global Positioning System. All in all, Garmin didn’t disappoint with functionality and overall quality of production. This product is one of the mid-budget top choices. Whether you’re an experienced angler or just an enthusiast, this finder will make a difference in the way you’re fishing. Many people praise this product as a high-end device, and we join in. If you have a more flexible budget, don’t hesitate to take a closer look at this product, and you might find it interesting and worth buying. Not many other finders can match these sonar capabilities and the accuracy of reading for this price. The additional features like auto-scroll make it easy to adjust to the fishing situation and dynamic.